Band disco service if required.
. 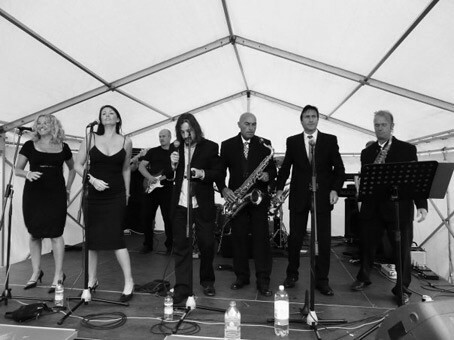 They are a Male fronted 10 Piece Band.
. Add Professional DJ from £275 extra. 1. 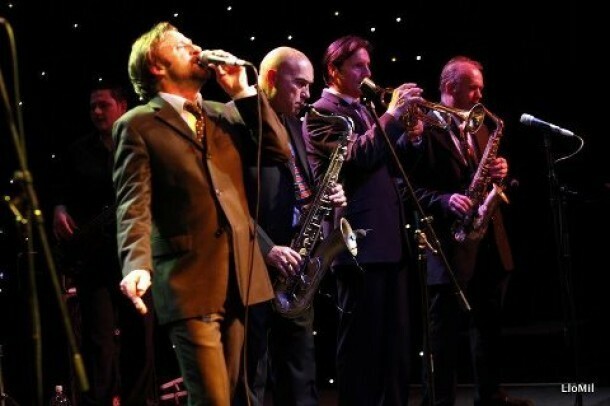 The ten piece band led by lead vocalist and focal point of the band Mike played to a full house at The Riverside. It was immediately obvious from the first number, when audience members were out of their seats (and some on their seats) to dance and sing along, that the audience was largely made up of their loyal following who knew exactly what they’d come to experience…a string of great soul classics played with minimal let up and maximum energy. It all began, as is customary with this band, with the horn section (as tight as ever) making their weaving processional entry through the audience from the back of the hall to join the rest of the band already on stage. And from there on it was pure delight as they ran through what seemed like the complete catalogue of soul classics. Particular highlights included Superstition with some wonderfully authentic sounding bass line, Sam Cooke’s Twisting The Night Away, Arthur Conley’s Sweet Soul Music with that fabulous brass riff that almost insists that you spring out of your seat and dance, and The Trammps’ Hold Back The Night in which horns and two female backing singers squeezed every ounce out of the smouldering classic. The Singer was, as ever, the ebullient master of ceremonies with his familiar gravel-voiced singing interspersed with high-pitched yelps. Maybe the biggest feature was the unanimity of performance from the whole band which exuded confidence and experience gained from years of playing on the circuit. A thoroughly enjoyable evening then…one would expect nothing less from a band so in tune with this joyful music. 2. An explosive start to the evening was provided by Soul Train Band. This is the way to play soul and Motown-a full ten piece band, great brass section, girl backing singers, pulsating rhythm section and Mike on lead vocals-not only great musicianship but also a great performance. I am not surprised that it is one of the most popular soul outfits as it was absolutely superb. If you book corporate functions or summer balls and want a great dance band, you could do a lot worse. This is a truly hot band. Big, brassy..soul music at its finest. Stax, Motown the real deal.. played like their lives depend on it! A soul band who enjoy soul music off and on the stage..real soul music buffs who bring their obvious enthusiasm onto the stage with ‘em! Check it out. A real soul band playing soul music with real soul! 3. Fantastic night at the Globe & many years since I last saw these guys play, won’t leave it so long next time they were brilliant, great sound. The place was rammed and shakin with loads of dancers. Fab night, fantastic band, great crowd. What more could you ask for! to Jools Holland and The pasadenas.